Description: The film opens in Chennai with a crusader television journalist Bharati (Genelia) trying to unravel corruption in high places. The state Home minister is hand in gloves with terrorists who are planning to create tension and planting bombs in Chennai. One day while escaping after a sting operation on city's nefarious activities she gets badly beaten and her two friends killed. At the same time in an accident, the thugs who had brutally bashed her meets with an accident and gets killed. Bharati creates an imaginary character called Velayudham and writes a note that he wants to clean up the city of the bad guys! Meanwhile there is a guy called Velayudham an ordinary milkman living in a small village who dotes on his little 'Thangachi' (Sarnya Mohan) and his life revolves around her, though his cousin Vaidehi (Hansika) is crazy about him. One day Velu comes to Chennai to withdraw the money he had deposited in a chit fund for his sister's wedding. 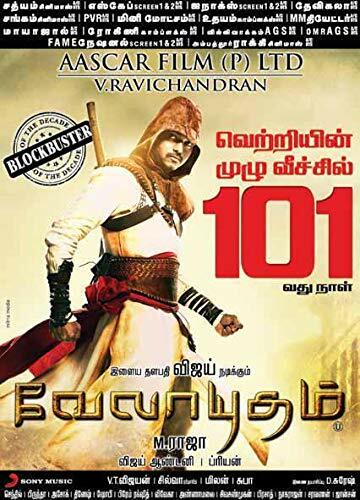 In the city, he meets Bharati and due to circumstances is forced to become the fictional character Velayudham who takes on the scum's of the earth.The film opens in Chennai with a crusader television journalist Bharati (Genelia) trying to unravel corruption in high places. The state Home minister is hand in gloves with terrorists who are planning to create tension and planting bombs in Chennai. One day while escaping after a sting operation on city's nefarious activities she gets badly beaten and her two friends killed. At the same time in an accident, the thugs who had brutally bashed her meets with an accident and gets killed. Bharati creates an imaginary character called Velayudham and writes a note that he wants to clean up the city of the bad guys! Meanwhile there is a guy called Velayudham an ordinary milkman living in a small village who dotes on his little 'Thangachi' (Sarnya Mohan) and his life revolves around her, though his cousin Vaidehi (Hansika) is crazy about him. One day Velu comes to Chennai to withdraw the money he had deposited in a chit fund for his sister's wedding. In the city, he meets Bharati and due to circumstances is forced to become the fictional character Velayudham who takes on the scum's of the earth.